Dr. Arijit Sen is an architect and vernacular architecture historian who writes, teaches and studies urban cultural landscapes. He has worked on post disaster reconstruction and community-based design in the Lower Ninth Ward, New Orleans and directed public history and cultural landscapes field schools in Milwaukee. Sen’s academic and research background is in architectural history, social, cultural and behavioral analysis of the built environment, and American cultural landscape studies. He teaches courses in American cultural landscapes that focus on methods of doing urban fieldwork and research. Currently an Associate Professor of Architecture at the University of Wisconsin Milwaukee with an honorary appointment with the Department of Art History at the University of Wisconsin Madison, Dr. Sen cofounded the multi-campus based Buildings-Landscapes-Cultures area of doctoral research on cultural landscapes. 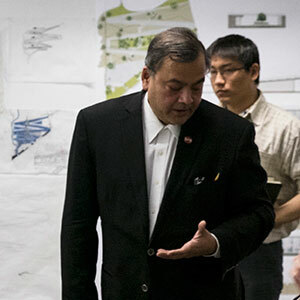 He serves on the board of the Vernacular Architecture Forum, a national organization dedicated to the study, preservation and analysis of the everyday world and the Society of Architectural Historians. Sen has coedited Landscapes of Mobility: Culture, Politics and Placemaking (Ashgate Publishers, UK, 2013, Jennifer Johung coeditor) and Making Place: Space and Embodiment in the City (Indiana University Press, 2014, Lisa Silverman coeditor). Making Place: Space and Embodiment in the City, (Arijit Sen and Lisa Silverman coeditors), Indiana University Press, 2014. Landscapes of Mobility: Culture, Politics and Placemaking, (Arijit Sen and Jennifer Johung coeditors), Ashgate Publishers, UK, 2013. “Discarding Corb’s Shoes: Marginal Voices and Local Histories from the Urban Edge,” Chandigarh Rethink: Transforming Ruralities & Edge(ness) in Global Urbanities, Manu Sobti (Ed. ), (San Francisco, ORA Editions, 2017). “Awe and Order: Ethno-Architecture in Everyday Life,” in Ethno-Architecture and the Politics of Migration, Mirjana Lozanovska (editor), (Abingdon, UK: Taylor & Francis/Routledge, 2015), p. 151-164. “Intertwined Cultures along Devon Avenue, Chicago,” Out of the Loop: Chicago. Virginia Price, David Spatz, Bradford Hunt (editors), Chicago: Miday Books, Agate Publishing, 2015), 749-825. “Picturing Milwaukee: Urban Public Space in the Age of the Anthropocene,” Placing the Golden Spike: Landscapes of the Anthropocene. Exhibition Catalog, Institute of Visual Arts, INOVA, March 26-June 13, 2015, Dehlia Hannah and Sara Karjewski Editors, (Oregon: Publication Studio, 2015), 136-148. “Staged Disappointment: Architecture and Cultural Contact” Winterthur Portfolio 47: 4 (Winter 2013), pp. 207-244. “Transcultural Place-making: Intertwined Spaces of Sacred and Secular on Devon Avenue, Chicago,” In Transcultural Cities: Border‐crossing & Placemaking, (Jeff Hou, editor, Routledge, 2013), p. 19-33.